Heatbed Automatically Heating up without setting temperature and reach more than 100 degree. Edited 1 time(s). Last edit at 01/09/2019 01:55PM by Abdul Mannan. Re: Heatbed Automatically Heating up without setting temperature and reach more than 100 degree. Thanks for reply and I have check the tabs they are fine. The problem is the same. Thanks for the reply, I have checked the polarity of the signal cable by swapping them but nothing changed. I had find the actual problem. The ramps D8 is continually giving 12v output when the bed temp is set to 0 degree which results into automatically heating up. Where as the D9 and D10 are giving 0V when they are set at 0. Is there is any setting for it in Marlin Firmware. D8, D9 and D10 are switched at the ground (-) side, while the (+) is directly connected to 12V - so you will always measure 12V at the (+) side of the connector. Does the D8 LED light up when you switch on the heatbed and remain dark when it's not active? Can you show us a photo of your wiring between the RAMPS, the MOSFET board and the power supply? Thanks for the reply. I have attached 6 pictures which are taken when the 3d printer is power up and no setting changes are made (when bed temp, fan and hotend temp are at 0 degree). As you can see in(as power up.JPG) the ramp D8(red) and mosfet light(blue) is turned on when the Heatbed temperature not activate or is set to 0 degree. As in(D8.JPG) you can see it is giving 12V when the bed temp is set to 0 degree in(lcd.png). Where as in(D9.JPG, D10 JPG) you can see it is giving 0V when the temp and fan is set to 0 degree in(lcd.png). The black wire with white tape represent positive wire which I put in place of red wire. Edited 1 time(s). Last edit at 01/11/2019 10:06PM by Abdul Mannan. meter set to volts, a range that will show 5v. if its is 5v, something in firmware is turning it on. Edited 1 time(s). Last edit at 01/12/2019 12:03AM by Dust. Thanks for the reply. 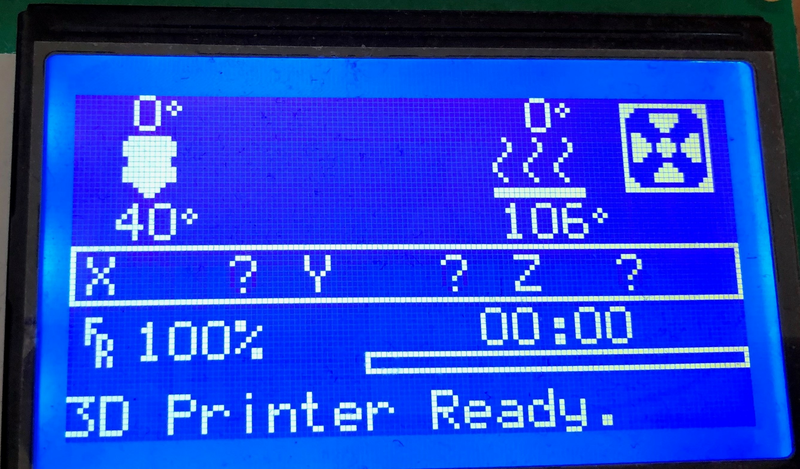 I had check the voltage twice, Once by powering up 3d printer and not changing the temperature/ or temp was 0 degree with the pictures named(D8 closed.JPG, D9 closed JPG). I had measured D9 Mosfet as well to compare with it. Then I set the heated bed temp to max(95') and fan to max(255) and then measure the voltage(D8 open.JPG, D9 open.JPG). As according to it D8 Mosfet is dead so I was thinking that rather than changing whole Ramp board or changing only D8 Mosfet. I can just flip the D8 pin setting in Marlin Firmware to D9 pin which will change EFB to EBF. As I am using 3 fans, 1: for ramp board(fan/5V), 2: Hot end(fan/5V), 3: cooling 3d print(blower/12v) I can power up the blower at its max speed and that will not be an issue. But will there be any problem if I change it and how exactly I would be able to change the setting in Marlin firmware. Thanks for the reply. My problem has been resolved but now in D8 I have install blower/12V to cool 3d print and is continuously running. Will that be any issue or not?